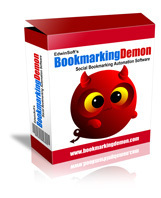 Buy Bookmarking Demon - Get 20k Free CAPTCHAs! BookmarkingDemon is a powerful Bookmarking automation tool for your content distribution efforts. With BookmarkingDemon, you no longer need to bookmark your sites manually. You can now submit your bookmarks to unlimited number of bookmarking sites automatically to boost your link popularity.